Raith Rovers Football Club regrets to announce the passing of three former players in the last few days. Star of the late 1940’s and 1950’s, Doug Stockdale, passed away on 23rd December. He was followed on Hogmanay by former stalwart player and coach of the 1960’s and 1970’s, Willie Benvie and then, yesterday, by contemporary 60’s legend, George Falconer. Supporters of Raith Rovers and Airdrie United are invited to join a minute’s applause prior to tomorrow’s match, to record our appreciation for the services of Rovers heroes of yesteryear. A well known face at Stark’s Park, Willie was born, brought up, and lived all his days in Kirkcaldy and was a Rovers supporter all his life. Willie was one of the finest inside forwards in Fife junior football when he turned out for Lochore Welfare and turned senior relatively late. He was rejected by Rovers in 1956 but went on to sign for Stirling Albion. He played over 100 games for the Annfield side before joining Dunfermline Athletic in 1960. With rave reviews with the Pars (where his name is still held in high regard), Jock Stein wanted him to turn full time, but at the age of 29 Willie felt it would be a mistake to do so. His decision to remain part time led to his dream move to his boyhood heroes – Raith Rovers. He joined Rovers in February 1961 and late said “It was a dream come true. I was playing in the same team as Willie McNaught, Andy Young and Johnny Urquhart who were all heroes of mine.” Willie played for a year and a half at Stark’s Park, scoring 8 goals in 39 appearances, before moving on to Cowdenbeath and finally Berwick Rangers. Although Willie played just 39 games, it is his 12 as Rovers coach for which he is remembered most. He rejoined Raith as reserve team coach in 1968 and spent three seasons in charge of the secons string before being promoted to first team coach in August 1971. It is testament to his coaching abilities that he remained at Stark’s Park under eight different managers, and was part of the backroom staff during the promotion campaigns in 1976 and 1978. Willie retired in 1980 and spent the remained of his life following Rovers from the main stand, and has missed only a handful of games during that time. Willie was also a valued member of Raith Rovers Former Players Association. It was also a testament, not just to his coaching abilities, but also of his demeanour, that he was respected by everyone he came across during his time in football.. Without exception, all of the players he played with and coached would invariably ask about Willie and actively seek him out whenever they visited Stark’s Park. At the New Year Derby, ex Dunfermline legends Willie Callaghan, Bert Paton and Roy Barry and ex Rovers great Paddy Wilson were visibly shaken at the news of Willie’s passing. Willie Benvie’s funeral will take place at Kirkcaldy Crematorium on Friday 11th January at 11 am, to which all former colleagues, friends and supporters are invited. Meanwhile everyone at Raith Rovers sends their deepest condolences to Willie’s wife Maureen, their son Ronnie, daugher Morna and their families at this sad time. George had originally been Gordon Wallace’s striking partner at Montrose and joined up with Wallace at Raith in May 1967. He finished season 1968/69 season as the club’s top scorer with 16 1st Division strikes. 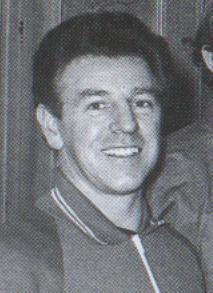 In 93 games from 1967 – 1970 he scored a total of 33 goals before moving to Dundee to link up once again with Gordon Wallace. A full obituary along with funeral arrangements will follow. Dougie was a winger who arrived at Stark’s Park from Lincoln City in 1948 and became part of the Second Division Championship side of 1949. He left Raith for Ayr United in 1951.